Death Valley is the largest national park in the lower 48 states boasting more than three million acres of wilderness and hosts over 1000 different species of plants and animals. Home to the lowest elevation point in North America and the towering peaks of the Panamint Range, Death Valley is a land of contrasts spanning across two states. Death Valley National Park can be divided into four distinct areas: Furnace Creek, Stovepipe Wells, Scotty's Castle, and Panamint Springs. On my spring 2012 trip, I visited Furnace Creek, Stovepipe Wells, and Panamint Springs areas. On our 2012 trip, we approached Death Valley from the southern entrance after a short trip to Pasadena. On our way up we stopped in Baker, California for a gyro at the Mad Greek restaurant, a surprisingly good food destination for a town out in the desert. In Baker, we got on State Route 127 to Shoshone. Shoshone has a fairly nice motel, which turned a blind eye to our nearly 90 lb Rottweiler mix and also hosts a naturally fed, mineral spring pool. Down the road from the motel, this pool is a night time water source for bats and retreat for eerily quiet drinkers who sit in the corner sipping Jack Daniels. It certainly makes for an interesting swim. Death Valley can be approached from the west on State Route 14 and US Route 395. From the east, U.S. Route 95 parallels the park from north to south with connecting highways at Scotty's Junction (State Route 267), Beatty (State Route 374), and Lathrop Wells (State Route 373). The National Parks Service warns: "GPS Navigation to sites to remote locations like Death Valley are notoriously unreliable. Numerous travelers have been directed to the wrong location or even dead-end or closed roads. Travelers should always carry up-to-date road maps to check the accuracy of GPS directions. " Death Valley is not an area you would want to get lost in. Furnace Creek is host a bright shiny visitor center. The rangers here are incredibly friendly and helpful. They pointed us to what they thought would be the best areas for camping given our dog and car situation (we were driving a Volkswagen Jetta). Not sure what else is going on at the visitor center, but if you have questions about where to camp it's a great resource. 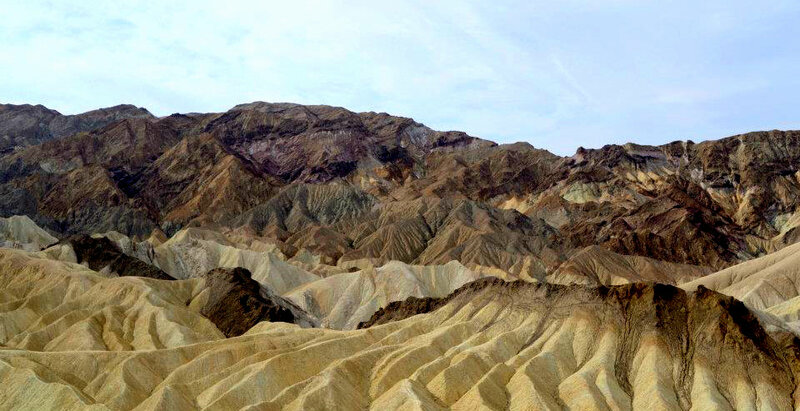 According to the NPS website for Death Valley, starting December 1, 2014 through March 31, 2015, all access to Zabriskie Point and surrounding area will be closed for major rehabilitation work to repair unstable support walls and improve conditions. Zabrsikie Point is a viewing point off Highway 190 and a short walk uphill. From the top is a breathtaking view of labyrinthine canyons of eroded, multi-hued rocks. One of the most startling rock formations I've ever seen. While I expected a colorful rock formation, this scenic loop drive through vibrant pastel volcanic and sedimentary hills is like stepping into a Technicolor set. Absolutely a must see for any visitor. This 9-mile one-way drive starts from Badwater Road and is only open to vehicles 25 feet or less in length. Okay, here is where I have to say Death Valley National Park is just incredible. Badwater Basin is the lowest elevation point in North America and the second lowest in the Western Hemisphere. This salt water flat is like nothing you have ever seen before and if you come to the park and not see it, then you are missing out on the whole point of Death Valley. Located on Badwater Road after the Artist's Drive. NPS recommends not walking on salt flats in hot weather. Continue driving up 190 and this will take you to the Stovepipe Wells area of the park. This is home to Stovepipe Wells Village which has dining, gas, and sleeping amenities, Mosaic Canyon, Titus Canyon, Salt Creek, and Mesquite Flat Sand Dunes. Smoothly rising dunes nearly 100 feet high from the surrounding Mesquite Flat, these dunes are relatively stable due to wind patterns in the park. Because of their easy access from the road and overall proximity of Death Valley to Hollywood, these dunes have been used to film several sand dune scenes including films in the Star Wars series. This was not the dog's favorite place to be. In the late afternoon spring sun, these sand dunes were almost unbearably hot for the poor guy and caused him to run around like an Lipizzaner. While we were unable to explore for long, we walked in between the dunes noting the creosote bushes and other plants unique to the landscape. NPS recommends visiting the dunes in the late evening and night time, but watch out for rattlesnakes. The last area we visited in the park is the Panamint Springs area. Panamint Springs you can find Darwin Falls, Father Crowley Vista, Lee Flat Joshua Trees, Wildrose Charcoal Kilns, Aguereberry Point, and Eureka Mine. Not too far north from our campsite at Wildrose are the Wildrose Charcoal Kilns. These ten beehive-shaped structures are among the best preserved in the west. Built in 1876 to provide fuel to process silver/lead ore, they still smell of smoke today. The gravel road leading to the kilns is approachable by vehicles and there is a parking lot, but we approached it on foot from the campsite. Eureka Mine is located on the way to Aguereberry Point, which boasts views of the Panamint Range, Badwater Basin, and Mount Charleston. Eureka Mine was a borax mine operated by Pete Aguereberry, a Basque miner, from 1905-1945. It's a fun, slightly eerie place to explore with open mine shafts, broken down cars, and train tracks to nowhere. Death Valley National Park might not be at the top of your list of places to visit in California, but it should be. The landscape is like no other; it is a park for every type of visitor with great hiking trails, long stretches of road for the biker and cyclist, and sights to see right from the car. Newer PostYosemite: Celebrate 125 Years at Tuolumne Meadows!